This is a throw-everything-in-the-pot kind of dish that you make 15 minutes before you sit down to dinner! 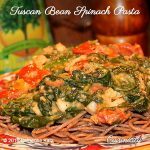 It is filled with spinach and whatever other greens you would like (I love baby arugula in particular) and the beans blend in perfectly with the white wine to create an almost creamy sauce (just take a look at the photo, amazing, right?!). 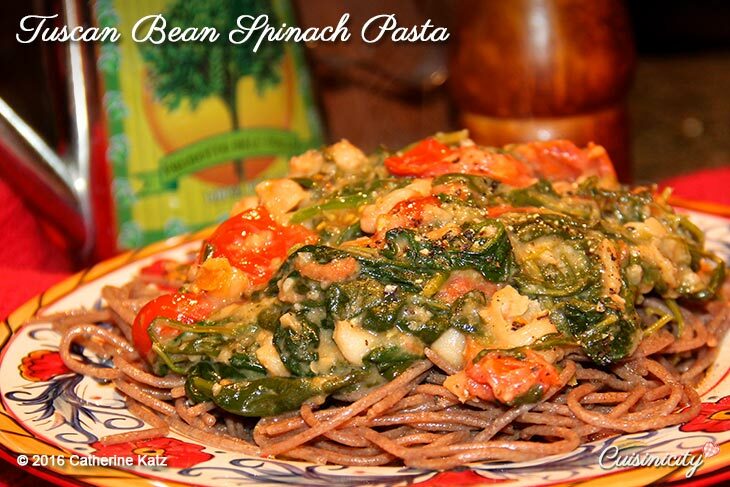 I like to serve it over wholegrain pasta (here is a brand I like very much)–Absolutely DELICIOUS! Heat 2 Tbsp of the oil in a large cast iron dutch oven (I like Le Creuset but any heavy bottom deep pan will do) over high heat, add the garlic and halved cherry tomatoes and sauté for 4-5 minutes, stirring occasionally to crush some of the tomatoes. Add the drained beans and wine and continue to cook while stirring for a few minutes to mash the beans a little bit with the white wine. Add the spinach and arugula, in batches (don't worry it will seem like it will never fit, but it cooks down quickly!! ), so keep adding it until it's all in there, and let it cook down, covered, for an additional 5-6 minutes. Add salt and fresh ground pepper and gently stir one last time. Serve over wholegrain pasta (use package cooking instructions) and, right before serving, drizzle with remaining 2 Tbsp olive oil. This sounds delicious. Can you publish the nutrition facts? We love this dish. I appreciated the video, too. I’ve made it half a dozen times and love that it is vegetarian. I serve it over whole wheat penne pasta. The small amount left over was made into a variation of pasta fagioli soup. Yumm! Thank you Linda! 🙂 Isn’t it so easy and yummy?! I love your idea of making the leftover into a pasta fagioli soup–PERFECT!!! This one is a keeper! Thank you. We sprinkled a few pine nuts on top too…. This looks delicous and simple, perfect for those times when I don’t really feel like cooking but still want to feed my family something healthy. I love your recipe for Pasta Fagiole as well, going to try it with spiralized zucchini (Zoodles) next time insead of the pasta.